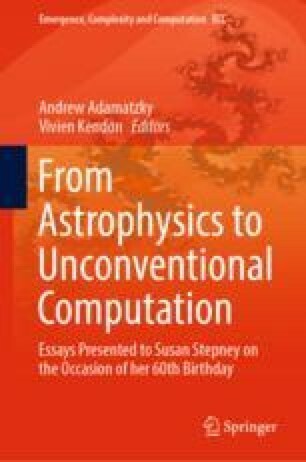 I had the distinct pleasure of meeting Dr. Susan Stepney in September 2006, on the occasion of the Fifth International Conference on Unconventional Computation (UC’06) held at the University of York in the United Kingdom. I learned a great deal at that conference co-chaired by Dr. Stepney, enough to motivate me to organize the sixth edition of that conference series the following year in Kingston, Ontario, Canada. This chapter relates my adventures in unconventional computation and natural computation, and offers some recollections on the path that led me to nonuniversality. It is dedicated to Susan in recognition of her contributions and in celebration of her 60th birthday. Parallelism Parallel computer Inherently parallel computations Unconventional computing Unconventional computational problems Quantum computing Quantum chess Computational geometry Quantum cryptography Superposition Entanglement Universality Nonuniversality Superlinear performance Speed Quality Natural computing DNA computer Biomolecular computing Simulation Key distribution Optical computing Sensor network Cellular automata Fully homomorphic encryption Cloud security.